The royals know how to party! After exchanging vows at Windsor Castle's St George's Chapel and enjoying some wedding cake and other nibbles at Queen Elizabeth II's formal afternoon reception, newlyweds Princess Eugenie and Jack Brooksbank and their guests, including celebs, headed to Windsor Great Park's Royal Lodge, the official royal residence of the bride's father Prince Andrew, for an evening reception. The fairground-themed bash took place in a tent on the estate's grounds and served as the ultimate after party, complete with pizza, tequila, games and a performance from friend Robbie Williams, who attended the bash with wife Ayda Field. Their daughter Teddy had served as one of Eugenie's bridesmaids. "Robbie jumped on stage," a source told Page Six. "Naomi Campbell and Demi Moore were dancing. Robbie would sing a line to one of his hits—and then he'd let the audience sing the next line." Several guests shared photos from the party, although there were no glimpses of the bride and groom in any of the images. The party had a bumper car ride and a coconut shy, MailOnline reported. There was a food truck that served pizza. Guests drank margaritas made with Casamigos tequila. The groom is a U.K. brand ambassador for the brand, co-founded by George Clooney. Like Eugenie and Jack's wedding cake, the evening reception had a fall theme, with gorgeous red, orange and yellow floral presentations. There were also gorgeous LED light displays on the grounds of the estate. 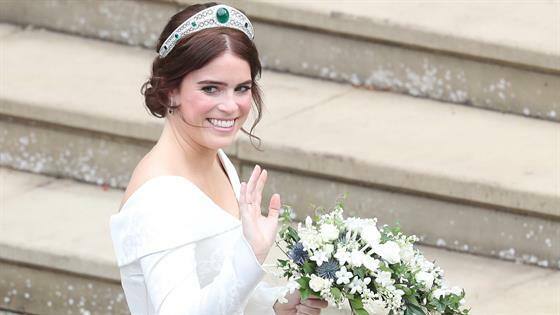 Eugenie's mother, Sarah, Duchess of York, changed out of the knee-length green dress she wore to the wedding ceremony into a lighter green gown for the evening reception. The festivities will continue on Saturday with a third wedding reception that will reportedly be carnival-themed. Page Six said that bash is set to start in the afternoon and continue until the early hours of Sunday.